1. Dahal R.K. 2017, Landslide susceptibility study in Sotkhola sub watershed, Surkhet, western Nepal, Bulletin of Nepal Geological Society, 34: 95-105, click here to download. 2. Dahal B.K. and Dahal R.K., 2017, Landslide hazard map: tool for optimization of low-cost mitigation, Geoenviron Disasters 4: 8. click here to download. 3. Dahal R.K., 2015, Earthquake-induced slope failure susceptibility in east Nepal, Journal of Nepal Geological Society, 49:49-56, click here to download. 4. 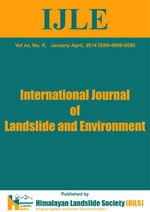 Dahal R.K. 2015, Engineering Geological Issues after Gorkha Earthquake 2015 in Nepal - a preliminary understanding, paper presented in 10th Asian Regional Conference of IAEG, Kyoto, Japan, to download proceeding paper click here. Namaskar! and thank you very much for visiting my homepage. This website reflects my life-long work and directs you to more resources if you are interested in pursuing the field of Himalayan Engineering Geology and Landslide Science. Here, you will also find more personal information about my experiences and publications in trying to stimulate landslide research and enlighten individuals to Himalayan Landslide Science that I and my research group have been uncovering. And please come back again, because I update this page regularly. Top 20 cited papers from Google Scholar Citation!! Copyright © 2019 Ranjan Kumar Dahal. All Rights Reserved.